During the Assessment stage, we work collaboratively with you to agree the detailed scope, approach and overall plan of what needs to be achieved. We then undertake a series of discovery activities to quickly gain an understanding and to document the current situation. We use a variety of techniques during this stage to ensure your business change starts from a solid base of fact, including desktop research using existing documents, desk-side and management interviews based on a pre-defined structure, high level mapping of processes and key process drivers, documentation of issues, root cause analysis and documentation of existing controls. During the Design stage, we help you to develop a solution to meet your needs, whether that’s a consistent business change management process architecture, a new target operating model or a technology architecture. Our consultants, based on their experience, challenge current thinking to develop a robust and sustainable model that can be fed back to you through workshops, presentations to key stakeholders and one-to-one meetings. Because we know insurance and its regulatory constraints, we can ensure the design of any solution is both a step change and also pragmatic. 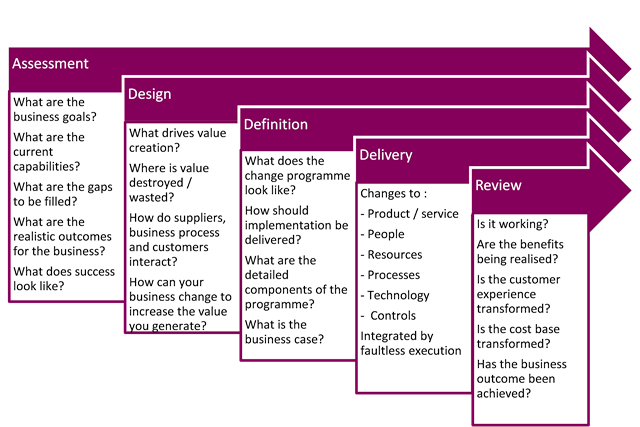 During the Definition stage, we help you to develop and document a prioritised performance management programme implementation plan and to create a business case for the project or programme based on costing out the benefits. The plan will not only cover the change programme to be undertaken but the processes to be used to manage delivery. During the Delivery stage, we provide structured programme and project management support to complement your own team, for just some or for all of the the various workstreams required to implement the process, organisation and system changes detailed in the design. During the Review stage, we work with you to ensure the planned benefits are realized, celebrating successes to ensure continued motivation and momentum. Our handover process identifies principal takeouts from the project, confirms that the necessary skills transfer has taken place, and embeds a continuous improvement philosophy to carry your business forward. 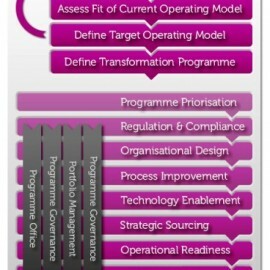 All these services are offered within a Programme Management structure that considers the full spread of workstreams—including organisation, process, location, IT and business change—and groups the deliverables from each workstream into stages or releases that allow you to take benefits throughout the lifecycle of the programme and maintain momentum. All of this is managed through a Programme Office that handles everything from planning and forecasting, risk and issue management and change control to benefits management, quality assurance and performance measurement. We combine experience in insurance with an approach to programme and project delivery based around five key stages that, together, deliver change. Our flexible approach to projects means you can engage with us in whatever way best suits your needs: for one or two stages to support your own capabilities or as a partner at every step in your change programme.